So, you have had your fun with your basketball hoop and now it's seen better days. You might be asking yourself "how the heck am I supposed to get rid of this thing"! Well, fear not bent basketball hoop owner, you have Trash Can Willys on your side! We are masters at dunking your old hoop in the trash where it belongs! One simple call gets it gone! We are a locally owned Basketball hoop dumping company and nothing floats are boat more than giving you're old hoop the pounding it needs as we slam it on the ground at the local recycling center after we pick it up to be disposed of! Whether its in a concrete footing or just a rolling weighted down base, we will get it gone! During our span of over 8 years in business in the local area we have slam dunked over 170 basketball hoops! Have you even dunked that many basketballs on it?! So just call the ball, give us a call and we will haul it all!! FYI- This picture is just a joke! We only make slam dunks like this!! The Balls In Your Court Now! 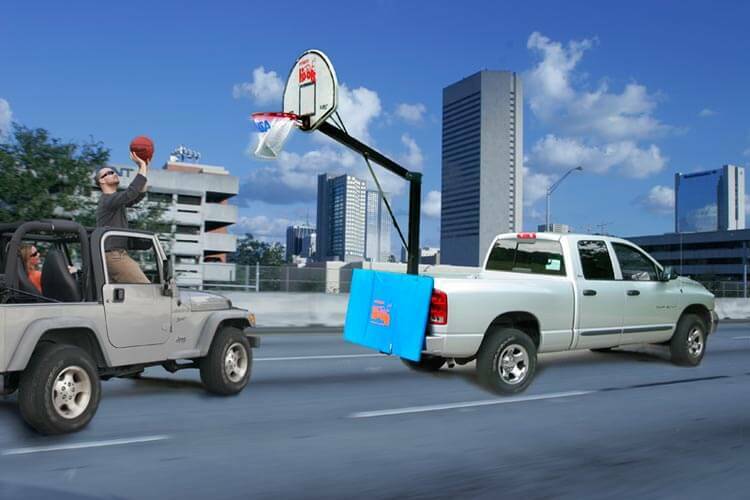 All your basketball hoop removal desires and dreams are just a click away!